The benefits of exercise and staying active are largely known and scientifically proven. However, people tend to shy away from working out as they get older, although interestingly enough, seniors can benefit from working out as much as younger people, if not more. Indeed, exercise can benefit seniors in many ways. It can promote mobility, flexibility and strength. It can improve the overall quality of life by enhancing moods and promoting healthy sleep. Working out also aids in maintaining a healthy weight, which can be tricky when we age as our metabolism tends to slow down. 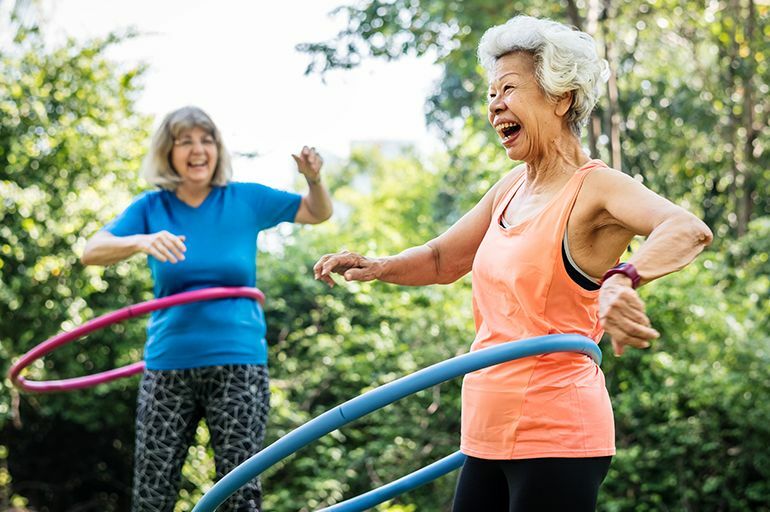 And perhaps most importantly, staying active can manage and even reduce the impact and chronic illnesses such as high blood pressure or diabetes, that are common among the elderly. Working out is a great way to improve a senior’s health, however, working out without medical clearance can be more dangerous than helpful. Indeed, before starting a workout program, it’s important to get your doctor’s okay. Therefore a medical exam is necessary to determine if the person has any contra-indications to exercise or any specific measures that need to be taken. Working out is good. Knowing the different kinds of exercise there is and their respective benefits is even better. So make sure to include strength, flexibility, cardiovascular and balance exercises for a diverse scope of health benefits. Balancing exercises are important in order to reinforce the muscles, nerve fibers and receptors responsible for keeping us steady. Doing balance exercises can help minimize falls and give you a strong-enough-system to bounce back and find your balance if you trip. Balance exercises are essential in the prevention of femur neck fractures which are so common in the elderly that they constitute a major international health concern. As we age, our joints tend to deteriorate and lose range of motion. They become painful and dry. However, the frequent solicitation of the joints through flexibility exercises ensures that the joints stay healthy, well-lubricated and that the range of motion remains wide. Our Home Care Assistance caregivers are experienced with range of motion exercises, we are here to help. Cardiovascular exercise is necessary to keep the heart and vascular system healthy. Gentle Cardiovascular exercise is very important to manage existing cardiovascular risk factors (obesity, high blood pressure, high cholesterol, etc.) as it helps to prevent the development of any serious heart diseases and can even help manage any cardiovascular conditions that have already developed. Many seniors don’t even think about doing strength and endurance workouts, but they are very good at preventing bone and muscle mass loss, which are very common as we get older. Strength workouts also help tone the body, and by increasing muscle mass they can also increase a person’s metabolism (the rate at which the chemical reactions in the body are conducted), which usually slows down as we age. Low impact exercises are usually the best suited for seniors. They allow for the same benefits of other traditional forms of exercises but do not put pressure on the joints. Indeed, running for example is to be avoided (unless you’ve been doing it forever and even then you’ll need your doctor’s approval). On the other hand, exercises like yoga, walking, and water sports have great cardiovascular as well strength training properties but they do not upset the joints. Age-related changes in total body water and thirst perception, among other factors, render older adults more susceptible to dehydration than the rest of the population. That’s why it’s important to really focus on getting the necessary amount of fluids and electrolytes during the day, especially more so if the person has been working out (or sweating for another reason). The first cause of falls in the elderly is weak eye sight. Imagine how dangerous it can be to work out, walk around or perform various exercises if the person can’t see very well. That’s why it’s very important to make sure you have good eye sight, and if not proceed to getting any eyewear necessary before starting your workout program. There are many eye glasses centers’ in Calgary that offer subsidized eye exams for seniors. Seniors can suffer from loneliness, especially in Calgary’s long winter climate, that’s why it’s a good idea to make the workout activity double as a social interaction. Don’t hesitate to join existing groups or to form your own with your workout buddies. Not only will your workouts be safer and more fun, but doing so will allow you to develop friendships and relationships with people who have similar lifestyles and interests. At Home Care Assistance Calgary, we have high caliber caregivers assist with your exercise routine. To get more information on our services, contact Home Care Assistance Calgary at 403-907-0861.